In marine ecosystems, the most significant migration observed in terms of biomass distribution is the one connected with the vertical movements in the water column. In the present study, the vertical profiles of the mesopelagic shrimps Gennadas elegans, Eusergestes arcticus, Sergia robusta, and the epipelagic Parasergestes vigilax in the Balearic Sea (western Mediterranean), during the stratified (summer) and non-stratified (autumn) hydrographic conditions, were investigated through their ontogeny, from the larval to adult stages. The mesopelagic adults were observed to move down to the deeper layers during the night more than during the daylight hours. Most larvae aggregated within the limits of the upper water column. The P. vigilax larvae were collected only during the stratified period. The first two larval stages vertical distribution indicates that the mesopelagic crustacean spawning could occur at greater depths. During the non-stratified period, the larvae of the mesopelagic species tended to remain at about 500 m depth at night, rising towards the upper layers at sunrise. Vertical patterns are discussed, as strategies associated with predator–prey trade-offs. 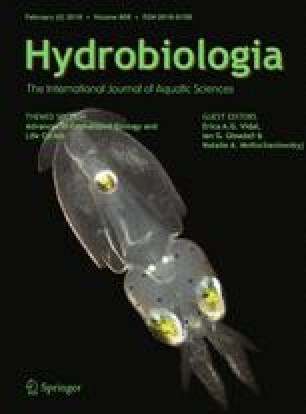 To our knowledge, the present study is the first such attempt to jointly analyze the vertical migrations of the developmental stages of the pelagic shrimps in the Mediterranean Sea. Handling editor: Juan Carlos Molinero. The authors express their gratitude to all participants in the IDEADOS surveys, as well as the chief scientists of both cruises. Special mention of thanks is due to the laboratory colleagues from COB, IPMA, and Lucia Rueda for the valuable suggestions in data analysis. The research was performed within the framework of the IDEADOS (CTM2008-04489-C03-01) project, funded by the National Plan I + D+i. A. P. Torres and M. Hidalgo were funded by a pre-doctoral FPI Fellowship and a post-doctoral contract, respectively, bestowed by the regional government of the Balearic Islands, Conselleria d’Educació, Cultura i Universitats, and selected as part of an operational program co-financed by the European Social Fund. The authors are also grateful to Integrated Marine Biogeochemistry and Ecosystem Research for the grant given to A. P. T. to present a part of these results in the Open Science Conference 2014, ‘Future Oceans’.